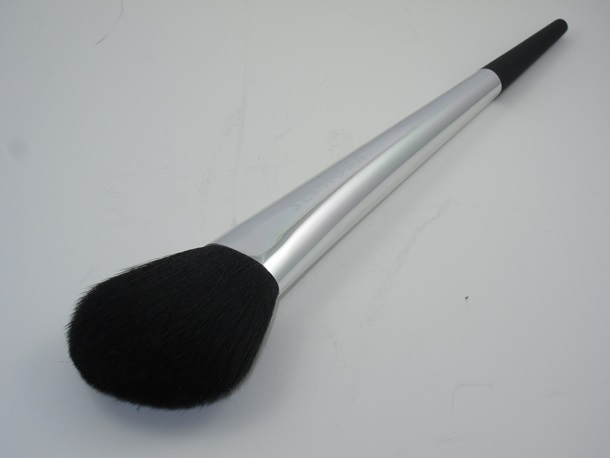 The Sephora Pro Visionary Precise Natural Powder Brush #121 is kinda my new toy of the moment. I’m kinda loving EVERYTHING about the Pro Visionary Collection of brushes lately and this new Precise Natural Powder Brush def has my attention at the moment. I don’t typically use powder all that much as I have drier skin. However, this brush actually makes me WANT to use powder. Now that the weather is starting to warm up I do need a little hint of powder to keep my oily areas nice and matte. Although I own a ton of brushes, literally a TON, I don’t technically own many face powder ones so the Pro Visionary Precise Natural Powder Brush gets happily added to both my stash and HG (holy grail) list. Sephora brushes have long been a favorite of mine. Although there makeup is hit and miss they have always had incredible brushes that are on par with MAC. This is a $36 brush but well worth the splurge. The natural, soft slightly floppy bristles are made of goat hair. The brush has no issues with shedding, odd smells, or any scratchy problems. The bristles are soft with less density than a blush brush which allows you to apply just the right dusting of powder without every doing it. I’m heavy handed so this is an ideal powder brush for me as the floppier bristles ensure I only apply a sheer dusting of powder on my face. This dusts powder on in a sheer layer allowing for breathable, lightweight coverage that reduces shine, brightens skin up, but never sticks or adheres to drier areas as again the bristles are so soft and floppy they allow for only the minimum amount of powder to be added to skin without ever over doing it! I used it with my denser Baviphat Sugar Girl Peach Sebum Solution Pact and my more silky Guerlain Meteorites Compact Pressed Illuminating and Mattifying Powder and even with my loose Clarins Poudre Multi-Eclat Mineral Loose Powder and with each application in a variety of formulas and finishes the Pro Visionary Precise Natural Powder Brush applied each powder flawlessly! One of the nicest thing about the brush is it can even sheer out a lighter powder. So if you recently purchased a powder that was a bit too light for your skin tone this can easily apply that powder transparently and sheerly to set your makeup but not leave behind a pasty finish! Let’s not forget it comes with Sephora’s very nifty plastic bristle protector that snaps on and off. This ensures your bristles never get crushed or split! Love! Sephora needs to start selling these individually! To say I’m impressed in an understatement. This was brush made quite an impression, well, really, all the Pro Visionary Brushes have really tickled me lately. They are ALL worth exploring. i’d never say that, I purchased a twelve buck fibre brush from aromaleigh one time and thought it was the bees knees ;-D hehe so I never write off a cheap brush hehe gotta try this and CC always has hecka good sales! So off topic but I need to get my nerd on. Apple is getting iWatch trademarked in a bunch of countries, whatcha think its gonna be :O? Probably all of the above…I imagine it’ll be the basics at first like music, calculator,etc…maybe weather, browse the web? not sure on the calling though that might future generation haha! curious minds but it feels so retro ya know?